Review: The story of a Palestinian widow who lives on the Palestinian West Bank. A Israeli minister of defence builds a house adjacent to her own. 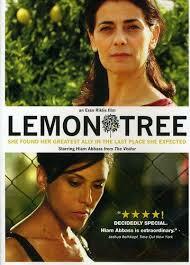 Her lemon trees are deemed a security risk and he wants the lemon grove town down. She must now defend her lemon tree field which was planted by her great grand parents. The original title for this film is Etz Limon. Watching this film was like watching a true story. I believed in all the characters and thought they were real. It was like going on a journey with them all. Hiam Abbass is brilliant and gave a fantastic performance. The cinematography is well done and gives us a glimpse into what the country is like. There are many people facing this dilemma.